Sony announced the PlayStation Classic earlier in the year, a pint-sized PSone console with a bunch of games pre-loaded. The mini machine is available right now, and you can get it from various retailers across the web. But where can you buy the PlayStation Classic? Here's a quick guide on the mini machine and how to order one before Christmas comes around. Which games are confirmed for the PlayStation Classic? Can you download more games to the PlayStation Classic? How much is the PlayStation Classic? What is the release date for PlayStation Classic? What is included in the box with PlayStation Classic? Is the PlayStation Classic any good? Here's where residents of the US can purchase PlayStation Classic. If you're interested, you'd best hurry up and get your order in place in case stock runs out before Christmas. Here are the retailers currently selling the PlayStation Classic in the UK. Be sure you get your orders in quickly, as there's no telling how long these will last ahead of the festive season. Got a question about the PlayStation Classic? Chances are we've answered it below. Feel free to pester us in the comments as well, where we'll aim to answer additional questions. 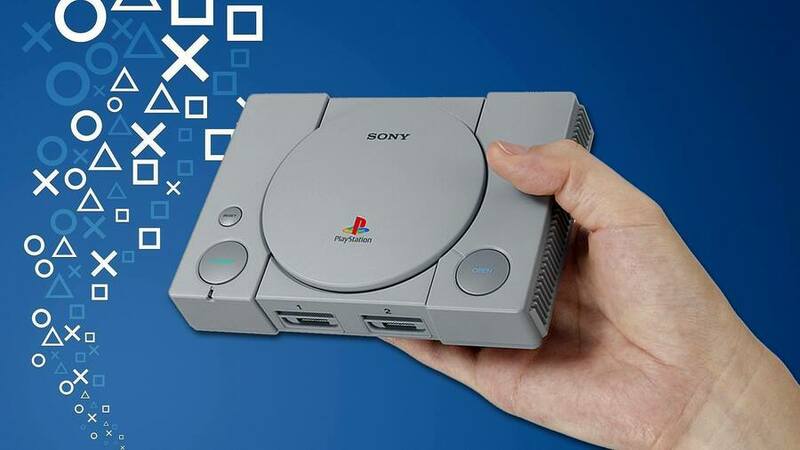 PlayStation Classic is a miniaturised version of the original PlayStation -- 45% smaller, to be precise. Rather than functioning as a full-blown console, the system has been pre-loaded with 20 of the best PSone games. You can't play your own games on PlayStation Classic, as the disc drive doesn't function and is too small to carry CDs. Instead, you simply plug the console into your TV and a USB power supply, and you'll have access to the 20 on-board games. It also comes with two full-size, original style PSone controllers for that extra retro feel. The Reset button on the PlayStation Classic pauses your progress in the game you're playing, while you use the disc eject button to select your game. You won't need any miniature memory cards, as the system will have built-in memory so you can save all your progress. Sony confirmed back in September that the PlayStation Classic won't have the ability to add more games to its library. There's no online connectivity whatsoever, and no disk tray to play any PlayStation games you already own. PlayStation Classic is going for an RRP of £89.99 / €99.99 / $99.99. The release date for PlayStation Classic is 3rd December. It's available right now! When you receive your PSone retro re-release, the box will contain the PlayStation Classic itself, an HDMI cable, a USB cable which can plug into any USB AC adapter, and two wired PlayStation controllers. It's important to note that an AC adapter is not included with the PlayStation Classic. The console has 20 games pre-installed, including Final Fantasy VII, Jumping Flash, Ridge Racer Type 4, Tekken 3, and Wild Arms. You can find a full list of all PlayStation Classic Mini games through the link. We rather like the PS Classic, but it's certainly not without its flaws. The design is meticulously detailed and it all runs efficiently, but there are some cases of inferior emulation that could potentially sour the experience. The choice of games is pretty strong, but there are some glaring omissions that perhaps belong on the PlayStation Classic more than some of the included titles. For a much, much more detailed assessment, click here to read our in-depth review, or watch our video review below. Will you be grabbing a PlayStation Classic? Take a nostalgia trip in the comments below. Fittingly enough it’s the first console I’ve ‘bought’ at launch & it’s the PSOne...Classic 😁. Keep that in mind when you're buying it. @Quintumply Could you look into the AC adapter? I've read conflicting reports about whether it comes with one or not. But the trailer itself says it doesn't. It's at 0:20. @Octane It comes with a USB cable, but no AC adapter, just like the NES/SNES Classics. @Quintumply So you can charge it via your TV? If so, then why are people complaining about this? Oof, a bit steep, but unlike the NES Mini, this is a Mini console I would actually not mind having. I love the PS1, it's one of my favorite consoles, and it looks like it has a stellar line-up. Just pre-ordered mine from Amazon. I'll wait until we get the list of games. I don't own either of the Nintendo retro consoles, but I could see myself buying this if it came with the right games. I get it's a bit more for collectors, but only 20 games and no digital controls for $100? It seems a little steep. Stings a tad seeing this released before PS1 classic support on PS4 too. Well in the UK at least pre-orders are still open so I don't think we are looking at a SNES classic style supply debacle or a strictly limited manufacture run. Scalpers must be sobbing. @Quintumply the NES/SNES classics came with a USB cable and a USB AC adapter. @hartleyshc The SNES Classic I bought earlier this year didn't have one, and the official Nintendo store tells me neither come with an adapter in the box. The NES and SNES mini have AC adapters in the US, but not in Europe. Is there any info on the length of the controller leads? EBGames have them up for $150. I wonder when they're going to reveal the rest of the games...? A bit worrying they still haven't revealed any of the other games but we'll see soon enough. Would be nice if they throw in a few extra games at the last second, taking it over 20. Seems really strange from Sony just over a month away from release and still no full list of games. But seems like loads of people have pre-ordered anyway which doesn't make sense to me. It would need some killer games for me to get it. @Octane So you mean to tell me if I click on this link in the article - "You can find a full list of all PlayStation Classic Mini games through the link." - that I won't actually find a FULL LIST of games? 😛 That's a rhetorical question by the way, I knew enough not to bother clicking on it. Was kinda hoping though that if PS decided to pull this article out of mothballs that they had the full list, I don't see the point of republishing it otherwise. And certainly no point in pre-ordering. "Pay $100 for 20 games now, we'll tell you what 14 of the games are after your check clears" doesn't really appeal to me. We're still in the dark about that list of games, aren't we? the usb argument adaptor with these consoles not included i dont get nearly all modern hdmi tvs have a usb slot that happily powers the console. If not seriously does no one have a dozen of the buggers from phones tablets etc kicking about in a drawer. @Old-Mrs-Cloggins You might be able to add games through less conventional means later on, same with the nes classic. And they if they officially add support to add more games it would just be more expense. I'll give it a miss for now. Some distinctly odd choices of games are in there; Intelligent Qube, Jumping Flash, Battle Arena Toshinden, Mr Driller and Revelations Persona to be exact. Absolutely garbage-tier games. Where's Gran Tourismo? Or Wipeout? Even some lesser known but still awesome games such as Vagrant Story or Legend of Dragoon? @Lord_English stands a good chance GT and Wipeout are not included because of the licensing issues with music on those games. Sorry but with lazy emulation and some great games not on there it is a big fat NO from me. Was so looking forward to this when it was first mentioned. I meant to cancel my pre-order, totally forgot about it. It arrived in the mail today. I'm keeping it just because it looks great on the shelf next to the NES and SNES minis, but my gawd the emulation on this thing is brutal. It's a pretty half-assed effort on Sony's part. Edit:. My 9 year old has been having a blast playing Demolition Derby. He says "this game is pretty fun, even though it looks all gross and pixely." Digital Foundry made this sound like a big miss. So I'd probably recommend not buying it, especially if you life in the USA. @daveh30 Sounds like your 9 year old needs to learn to respect their elders.